Are you looking for gift ideas for dog lovers, dog owners and dogs in your life? Whether it’s for Christmas, a birthday, anniversary, promotion or any other celebratory occasion – we’ve got you covered! 1. Animal candles: Candles are a classic choice of gift, and can help you feel more relaxed at home.Take a look at these excellent geometric animal candles from Pet Presents! 4. Dog shaped soaps and bath bombs: There’s no better way to relax than soaking in a hot bath, and dog shaped soaps and bath bombs can make the experience even better! Take a look at the Mylo Dog soap by FruFru! 5. Dog themed plates, bowls and cutlery: Bring dogs into your dining experience with dog-themed plates, bowls and cutlery! 6. Dog themed baking supplies: From dog bone cake pans to dog paw cookie cutters, there are plenty of fun, dog themed baking supplies you could gift to enthusiastic bakers looking to show off their passion for dogs in a different way! You could even complement this gift with a personalised apron! 7. Dog treat jars: A personalised, ceramic treat jar would be a perfect way for a dog owner to store their dog’s treats. The only challenge is keeping it away from prying paws! Take a look at the D for Dog website for a range of treat jars and canisters, which would make great gifts for dog lovers. 9. Dog gates: Dog gates separate dogs from areas of a house that are off limits (whether temporarily or full-time), and there’s lots of snazzy and stylish options available online which would make a great gift! 10. Personalised dog lead holder: A dog lead holder doesn’t have to just be a hook on a wall – you can get many colourful holders that will brighten up any home. Check out these unique key and dog lead holders by Pug and Puffin! 11. Dog themed wine gifts: For the wine lovers out there, there are a great range of glassware, wine racks and wine stockers featuring many of the most popular dog breeds available on Etsy! 12. Personalised pet mugs and coasters: You could get your dog lover’s dog printed onto a matching mug and coaster set to add something fun and customised to their living room or kitchen. Check out this personalised ceramic mug and coaster set from Pets Pyjamas! 14. “Feed the dog” reminder: To help children to help take care of their furry friends, you could gift them a “feed the dog” reminder panel that they can use to keep track of when their dog should be fed. Perfect to hang up in the kitchen! 17. Dog tail magnets: Make your fridge look more jazzy by gifting a set of canine magnets! 18. Sculpture of your dog: A dog sculpture would be a great addition to any home. Check out these excellent sculptures by Tanya Russell! 20. Dog wind chime: Enjoy the soothing notes of this melodic Dog Wind Chime from the Guide Dog’s gift shop. 22. Dog prints and posters: There are thousands of unique prints and posters available online, featuring our four-legged friends! Check out the Junqiue website for a range of great dog prints, which would make a great gift for any dog lover. 23. Personalised money box: For dog lover’s saving for their next adventure with their furry friends! 25. Custom paw print jewellery or keyrings: Hand on Heart Jewellery offer the opportunity for dog owners to take the perfect paw print from their dog using their inkless home paw print kits, which is then used to create a unique piece of paw print jewellery. Alternatively, owners can keep the prints as a special keepsake. We think this would be wonderful gift for any dog lover! 27. Your Dog Temporary Tattoos: If the dog lover in your life has considered a tattoo in the past, upload a photo of their pooch to the Dogsy website, and they’ll turn it into a sheet of temporary tattoos which would make a fun and unique gift! 28. Handmade dog bags: The Little Dog Laughed offer many handmade bags that would be perfect for any dog lover! 29. Customised dog socks: We think these customised dog socks from Pawwsy are a fun way to make dogs a part of your daily wardrobe, without breaking any dress code policies! 30. T-shirts and hoodies for dog lovers: A new t-shirt or hoodie is a great way for dog owners to make a statement and share their love of dogs with everyone they meet. Take a look at the slogan t-shirts, hats and hoodies available from D for Dog. 31. Dog onesie: A onesie is a perfect gift for dog lovers and owners looking for something cosy and fun to wear in the winter months. The all-in-one Company offer a range of great onesies featuring all our favourite breeds. What’s more – you can make the designs unique to you by changing fabrics, features and add ons! 39. Dog treats: Don’t forget, treats aren’t just for humans! However, please make sure to buy healthy dog treats from a reputable provider. 41. Dog adult colouring book: You could join the growing trend of adults taking to colouring to boost their wellbeing and wind down at the end of the day. We like the ‘Keep Calm and Colour Dogs’ adult colouring book from Wordery! 43. Dog knitting set: Instead of buying a blanket or coat for their dog, you could gift dog owners with a knitting set so they can learn how to make their own blankets, or take to knitting just for fun! 44. “Make your own” dog treats set: A cooking set would be a fun way for dog owners to create something new for their dog to enjoy! What’s more – you could buy them some different dog treat recipes to go with it, so they can mix it up every time! 45. Dog notebooks or planners: For the dog lovers who like to keep organised (and love a good list!) a classic choice for a gift would be a dog themed notebook, planner or diary! In Your Dog House Gifts offer a selection of notebooks which would make a lovely gift for any dog lover! What’s more – all profits go towards organising The Great Dog Walk Together events and finding ways for more people to enjoy the company of dogs to promote wellbeing. 47. Personalised dog wrapping paper: Wrap up your presents with unique wrapping paper featuring your friend’s dog, from Dogsy! 48. Customised dog stickers: Turn a picture of your friend’s dog into a sheet of custom stickers, which they can use in their planners or diaries! 50. Dog themed car stickers: Jazz up any car by gifting a customised car sticker with a fun slogan or quote. 51. Customised storybook: A perfect gift for kids who love dogs, the Petlandia customised storybook can star a dog of your creation in a unique story! 52. Bubble machine: For dogs who love bubbles, a bubble-blowing machine from Doggie Solutions can be great fun and great exercise. Dog owners can blow bubbles high into the air and watch their dog chase, jump and pop the bubbles! 53. A dog-related film: We all love a heart-warming story featuring loveable or heroic dogs! You could gift a classic film with a leading canine, such as Marmaduke or Marley & Me. 54. Dog themed games: From ‘dog top trumps’ and ‘dog bingo’, to ‘dog dominos’ and ‘Dog-opoly’, there are lots of dog themed spins on classic board games, which could be the perfect past time for any dog lover! 55. A new chew toy or Frisbee: When it comes to gifts for dog owners, you can’t go wrong with a new toy for their furry friend. We like the Pet’s At Home glow ball and the Kong Safestix! 56. Interactive treat puzzles for dogs: Interactive toys from Nina Ottosson can help reduce boredom in dog’s and can help strengthen the bond between dog and dog owner. 57. Dog photography book: If there’s one thing for sure, we all love taking photos of our pets! You could gift a book that can help boost photography skills, or a book that show cases the funniest and cutest dog pictures around. 58. Dog fiction: The literary world is full of fictional canines starring in great adventures and heart felt stories. If your dog lover is a keen bookworm, gift them with a new story to add to their bookcase! 59. Dog Calming Music Album: A music album could make a great gift for a dog owner who loves nothing better than sitting back with their dog at the end of hard day! Play. Relax is a music album for dogs by the Scottish SPCA, produced in line with the University of Glasgow’s academic research into music that helps dogs relax! 60. Polaroid camera: With a Polaroid camera under their belt, the dog lovers in your life can take pictures of their pet and instantly have a printed copy to hold as a keepsake! 61. Custom Pet Soft Toy or Puppet: Edinburgh-based Picture to Puppet can transform a picture of your pet (or someone else’s) into a custom pet soft toy. We think this could be a wonderful gift! 64. Safety lights: For dog owners and dogs walking at night, there is higher chance for injury so safety is important. Safety lights by K9 Active can help their dog stay visible in the dark, and would be the perfect, practical gift for any Christmas, birthday or celebration! 65. Dog drying coats: There’s nothing more time-consuming for a dog owner than drying their dog’s coat after a bath or playtime! Solve this problem by gifting them a drying coat. Ruff and Tumble are market leaders in Dog Drying Coats and offer dog drying robes, mitts, bed covers and sofa throws which are ideal for managing wet dogs. 66. Dog ramps/stairs: For owners with older dogs, a thoughtful gift could be a dog stair or ramp to help them get in the car or on a sofa more comfortably. 67. Grooming products: Help dog owners to tackle smelly odours with a shampoo, conditioner, wipe or spray for their dog! 68. Basic first aid kit for dogs: By gifting a dog owner with a first aid kit for dogs, it means that if their pet suffers a cut, bruise or strain, they will be fully prepared to help their dog in the best way they can whilst they seek veterinary help. 69. Car seat cover: Purchasing a car seat cover means dog owners can spend less time cleaning muddy paw prints from their car, and more time outside with their dogs! 70. Personalised dog bowl: Have your dog lover’s pet eating in style with a dog bowl designed just for them! Chow Bella Pet Bowls offer handmade, personalised pet bowls, which we think would make a wonderful gift! 71. Tennis ball holder: Dogs love tennis balls, but the one downside for owners is having to carry around a wet, slobbery and dirty tennis ball after a play session! A tennis ball holder solves this problem, and would be a practical gift for any dog owner! 72. Urine detector flashlight: The Simple Solution Spot Spotter is a great way to identify old and dried stains that give off a strong smelling odour. 73. Waterproof GPS tracker: Losing their beloved dog is surely a dog owner’s worst nightmare; you can help ensure this never happens by gifting them with a GPS tracker! 74. Dog webcam: Dog owners can use the Furbo dog camera to keep an eye on their pet whilst they’re away from home. 75. Dog health and activity monitor: Dog owners can use the dog health and activity monitor, Pitpat, to learn more about their dog’s activity, track their pooch’s progress and share their dog’s exercise stats with friends, vets and trainers. 77. Dog treat maker: Having a dog treat maker means dog owners can whip up delicious treats for their dog’s in a matter of minutes. What’s more – they’ll know exactly what ingredients have gone into making them for extra peace of mind! 78. Dog bed: You could gift the dog owner in your life a new bed for their beloved pet to doze away in. Chelsea Dogs sell a wide selection of dog crate beds and crate mats suitable for both puppies and adult dogs! 79. Dog brushes: Choose from a range of combs and brushes as a gift for the dog lover in your life! 80. Gift card to pet supplies store: Help your dog owner stock up on all the essential supplies by gifting them a card to their local pet supplies store, such as Pets at Home. 81. Subscription to monthly gift box service: We love the Pawsomebox gift box service, which surprises dog owners each month with a box full of quality dog products! You can choose from a 12, 6, 3 or 1 month subscription plan. 82. Gift card to a dog gift shop: If you’re struggling to decide what gift is best, why not simply buy a gift card to a dog gift shop, and leave the decision to the dog owner to pick something that is best for them? 83. Gift card to dog walking services: We don’t always have time to take our dog for two walks per day, especially if you’re juggling busy home and professional lives. Why not give your local dog walker a call and see if you can arrange a gift card or pre-payment to take the pressure off during busy periods? 84. Subscription to a dog magazine: Why not treat the dog lover in your life to a subscription to a magazine all about man’s best friend?! They can learn more about behaviour and training, as well as keep up-to-date with the latest news in the dog world. We love Your Dog and Dog’s Today. 85. Sponsor a dog: Sponsoring a dog on behalf of your friend is a thoughtful gift that contributes to charity at the same time! They will receive special merchandise and personalised updates on their dog’s progress throughout the year. You could support Dogs Trust or Guide Dogs. 86. The Calming gift box for dogs: The Calming Gift Box for Dogs by My Pet Gift Box is a great gift for dog owners looking to help their dog cope with stress and anxiety, or just relax! The gift box contains a selection of treats and toys from top brands including Kong, Pooch and Mutt, Lily’s Kitchen and Forthglade. 87. Dog garden gift kit: This Garden Gift set from Not On The Highstreet would be a unique gift for enthusiastic gardeners who want to create a dog-friendly garden, and includes a selection of dog friendly herbs. 88. Gift voucher to a dog friendly restaurant/cafe: Buying a gift voucher to a dog friendly restaurant or cafe is a great gift for dog lovers, as they can bring their beloved pet along with them for breakfast or dinner! 89. Dog grooming services gift card: Keeping a dog groomed and clean can be expensive and time-consuming, so it’s worth contacting your local dog grooming service, to see if they offer gift cards for their services that you can give to your dog owner as a gift. 90. Gift card for dog boarding: Could you buy the dog owner in your life a gift card for dog boarding services, so their next holiday is less expensive? 91. Hydrotherapy sessions gift card: The benefits of hydrotherapy to dogs are endless. Not only is it a great way for dogs to have fun, but it also helps dogs stay fit, lose weight and ease symptoms of arthritis. Contact your local hydrotherapy service to see if you can purchase some sessions for the dog owner in your life! 92. 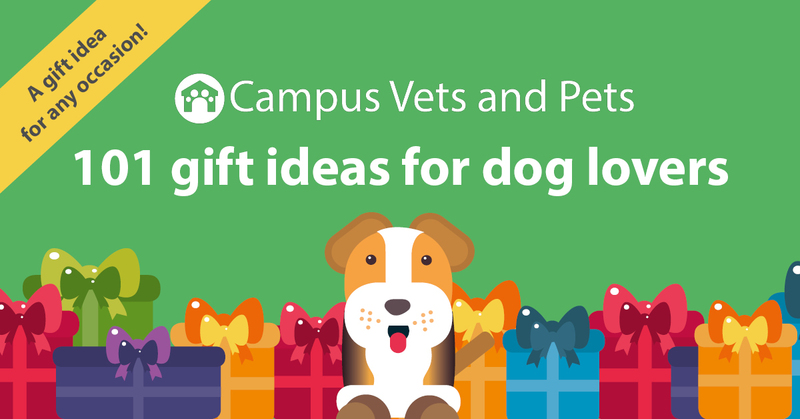 A ‘vet voucher’: You could buy a gift card to contribute towards the dog owner’s veterinary costs. Take a look at the Vet Vouchers website to see if your local veterinary practice is part of the scheme! 93. Puppy classes or dog agility classes: Dog agility or puppy training classes are a great way for a dog owner and dog to bond, learn new skills and create fun memories. You could buy them a few starter sessions so they can have a go! Take a look on The Kennel Club website to find accredited trainers near you! 94. Tickets to Dog Fest: Dog Fest is the UK’s ultimate festival for dogs, and we think this would make a great gift for dog owners looking to create fun memories with their dog. What’s more – you can choose from three different locations! 96. A Guide to Dog Friendly Travel: For those looking to travel or take a holiday with their dog in tow, a guide to the best dog friendly attractions, pubs and hotels around the UK or beyond would be a helpful addition to a dog owner’s travels. This article is jam packed full of gift ideas for dog lovers which are perfect to put under your Christmas tree, however take a look below at our special list of Christmas-themed presents to help the dog owners and dog lovers in your life get into the festive spirit this the holiday season! 100. Christmas jumpers for dog owners! Remember: If you’re looking for Christmas cards, many dog welfare charities such as Dog’s Trust and Guide Dogs offer a selection of lovely card designs available on their online gift shops! Have an idea not listed here? Contact us and let us know!